It has taken me three days to recover from the fried mess here! I also had camnesia on Saturday, so I'm going to use your iPhone pictures! 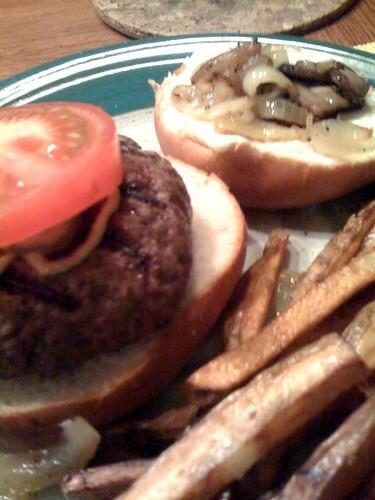 N and I were so involved with making three different types of dough that we slacked on the dinner plans and just made burgers with buns from Top, homemade french fries (a frying disaster! ), and a salad I didn't bother to toss but really enjoyed eating as counter to all of that fried stuff. I had already planned to make beignet, but N decided he wanted to make funnel cake since we were going to be frying anyway. N made two different funnel cake recipes because he couldn't decide which would taste better and they are very different recipes. 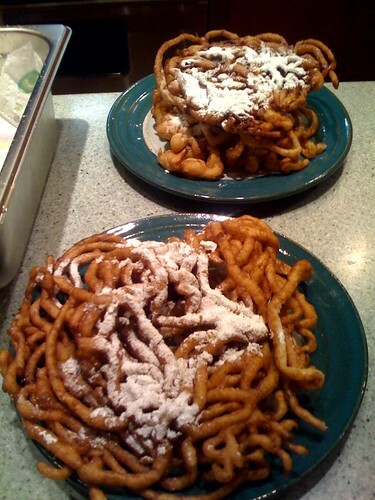 He made Alton Brown's Funnel Cake recipe, which we all thought had a superior texture. He also made this recipe, which we felt had a superior taste. I made Buttermilk Beignet. The dough was really easy to make -- mostly buttermilk and flour. It was very wet and I had to resist the urge to add more flour to it. I liked being able to refrigerate the prepared dough until we were ready to fry them up. The texture of the beignet changed quite a bit depending on the oil temperature -- we had some trouble keeping the temperature consistent on the large burner. 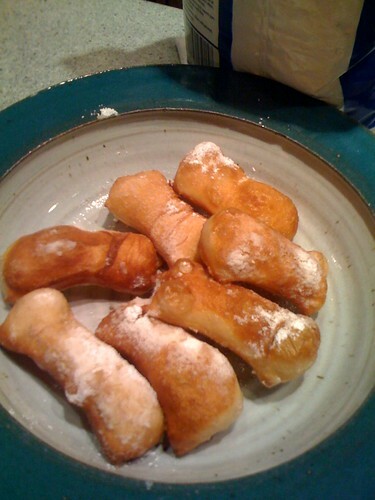 At a lower temperature, the beignet were more oily. At a higher temperature, they puffed too quickly and were almost hollow inside. At the proper temperature of 375°F, they had dough texture inside and were crispy outside. They were fairly bland, but very tasty dipped in pastry cream and raspberry purée! When I was prepping / cooking ahead for this meal, I thought to myself that this meal is not balanced. I have too many chicken dishes. When I mention that to you, you told me I was over-engr! I worry a lot when I cook, especially when it is something 'different'. I am naturally a worrier but I am taking the first step in my 12 steps program to stop worrying. Ahem. Below are links to recipes. Mapo Tofu, recipe, I mistakenly bought firm tofu instead of silken. It hold it's shape, but not as er... silky. Black Bean Spare Ribs, recipe with additional few hours of braise time in oven. I browned meat and simmered the sauce, then pile on top of an onion to braise in the oven for a few hours. Red Bean soup, red beans + palm sugar + brown slab sugar + tangerine peel + ginger + a few hours of simmer. I like my beans more broken down, which makes the soup thicker and more puree like. After dinner, N and G watched Apolo Ohno win the Silver Metal in the short track. We had some quiet time and Red Bean soup. Hope you liked it! We played a couple of games of Castle, but I think mostly everyone was in food coma. 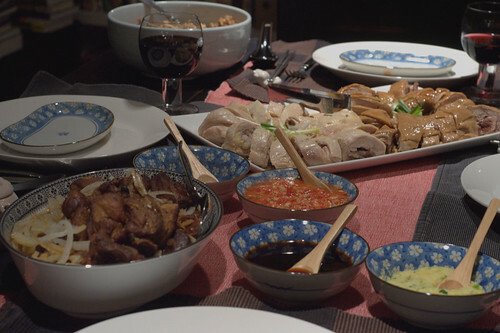 What happened to being hungry a couple of hours after Chinese Food? I hope you are recovering nicely from dinner on Saturday and hours of UNO. I'm looking forward to some of your leftover mushroom-barley soup for lunch today! Yum. I modified the rye bread recipe a bit due to not having any instant yeast -- I used rapid rise in one loaf and active dry in the other and proofed it before mixing up the sponge. It seemed to work out just fine. The recipe is wonderful. Now I can't wait to try making pumpernickel.